Padraic Kennedy from the Military Archives at Cathal Brugha Barracks will give a talk – An introduction to our sources for military history and recent initiatives – on Tuesday 9 October at the National Library of Ireland (NAI). This is a re-arranged presentation, originally scheduled as part of the Library's 20x20 series of lunchtime talks in August, which were organised by Eneclann and the Ancestor Network. Cost: Free. No booking required. 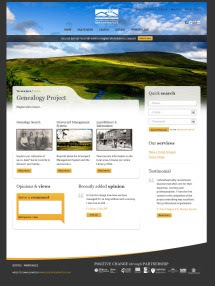 An additional 17,000 birth and death records have been uploaded to RootsIreland.ie. There is no indication on the website as to whether these are parish registers or civil records, but in view of the term 'birth and death' rather than 'baptism and burial', I'd assume them to be civil. 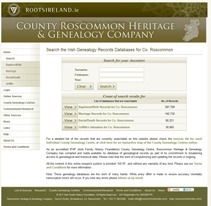 You can view a list of all the resources held by the County Roscommon Heritage & Genealogy Company here. A new book by immigration historian and genealogist Terrence Punch FIGRS has been published. 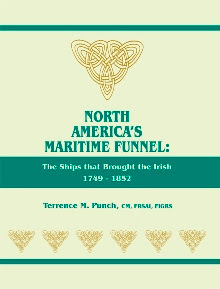 North America’s Maritime Funnel: The Ships that brought the Irish 1749-1852 is the result of groundbreaking research into the voyages made between Ireland and the Maritime Provinces of Canada – New Brunswick, Nova Scotia and Prince Edward Island. These areas were convenient destinations for Irish immigrants and functioned as the narrow end of a funnel through which tens of thousands dispersed across the North American continent. The book provides a chronological list of the voyages (there were about 1500 in total). It gives the names of the vessels and their carrying capacity, information about the ports and their hinterland, passenger acts and the concepts of tonnage/burthen. It also provides the dates of departure and arrival, and adds a great variety of detail (including five appendices rich in names) concerning passengers and crew and the voyages themselves. Supported by a history of Irish emigration, the book is built around a year-by-year listing of known voyages. Scattered throughout the list of voyages are the names of passengers, some gleaned directly from passenger lists, others from related sources such as land records and newspaper accounts that by chance connect passengers to the ships, while in other cases references are given to previously published passenger lists. Only 123 passenger lists survive of the 1,500 voyages, but through extensive research, Terry Punch has managed to fill in many of the gaps. Published this month by the Genealogical Publishing Company, the 172-pg book (with maps and index) costs $33+pp (£21.20/€24+pp via Amazon). 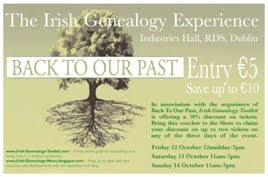 The Irish Genealogical Research Society has announced details of its Autumn Lecture. Professor Jane Ohlemeyer will present her lecture on genealogical sources relevant to her recently published book – Making Ireland English: How the Aristocracy shaped Seventeenth Century Ireland. Find My Past UK is offering 10% off the price of a subscription to its database. The UK site gives access to births, marriages and deaths in England and Wales, the 1841-1901 censuses for England, Scotland and Wales, and a wide raft of additional records including military, education & work and travel & migration records. To claim your 10% discount, just enter this promotional code – SUB10 – when you sign up for a subscription. Today marks the 100th anniversary of the signing of the Ulster Covenant, and there will be little opportunity to ignore it this weekend! You can even go online and sign the Covenant yourself! At midday today a dedicated website – www.covenant2012.org – will go live*, marking exactly 100 years from when Sir Edward Carson became the first person to sign the Ulster Covenant. Should the moment grab you, you can then add your own signature. Alternatively, you might prefer to learn a bit more about this historic event and search the documents and nearly half a million signatures it produced. All freely available at PRONI. Below, there's a collection of features and a video that I've rounded up from a quick recce of newspaper/online coverage. Scientists show Ulster Covenant was not 'signed in blood'. An interesting day conference has been organised to look at how Irish anniversaries are being commemmorated during the decade of centenaries that's now underway. Commemorations; Inspiration or Challenge? will be held on Saturday 6 October at Parkanaur Manor House, Dungannon, Co Tyrone. It is hosted by Ulster Local History Trust. Scrambling for the bones of the Patriot Dead: Commemorating the Irish Revolution 1913-23, with Professor Diarmaid Ferriter, Professor of Modern History, UCD. 1690, 1916 and all that: key changes in commemorations in Ireland over the last half century, with Brian M Walker, Professor Emeritus of Irish Studies, QUB. Commemorating Irish Unionist resistence to Home Rule, 1911-2012, with Dr Timothy Bowman, Senior Lecturer in History, University of Kent. Labour history, historiography, and the decade of centenaries, with Dr Emmet O'Connor, Senior Lecturer, Dept of History, University of Ulster, Magee College, Derry-Londonderry. Commemorating local saints in A Dictionary of Irish Saints, with Professor Emeritus Pádraig Ó Riain, Director of Locus Project, Dept of Early and Medieval Irish, UCC. Booking fee: £24 or €30, inclusive. Two new websites – Places to See and Monuments to Visit – have been launched to highlight lesser known national monuments and heritage buildings that are open to the public. They are an initiative by the Department of Arts, Heritage and the Gaeltacht and are intended to encourage tourists to visit locations that might not otherwise be on their itineraries. Both websites feature easy-to-use digital maps that provide directions to the sites and details of what the visitor can expect to find on arrival. In launching the websites, Minister Jimmy Deenihan, TD, paid special tribute to the role the farming community has played in protecting Ireland’s archaeological heritage. It's been a busy week for UK records this week at FamilySearch! In addition to the big Welsh upload yesterday and the Kent collections a couple of days before (since updated, see report), FamilySearch has added more than 4million army and merchant navy records. These are of huge relevance to Irish genealogy research because so many Irish men worked at sea or were soldiers. In the Chelsea Pensioners collection, for example, some 17% of records relate to Irishmen. Incidentally, don't infer from the term 'pension' that the soldier was elderly; soldiers became eligible for a pension after just 12 years service or even earlier if they were wounded. These are the collections now indexed on FamilySearch. The Merchant Navy Seamen collection is an index of the collection held by The National Archives in Kew, London. Details provided by the search are limited to name, date of birth and place of birth. To see the full record you need to access TNA. A search of the Chelsea Pensioners records returns similar information. To view the full record you can either visit an LDS Family History Centre (FHC) where access will be provided free, or click to FindMyPastUK where a subscription or pay-per-view arrangement applies. The Militia Service records return just name and place of birth and these, too, are available free at FHCs or, with fees, at FindMyPastUK. In addition to the above records, FamilySearch has added indexes to the Plymouth and West Devon Parish Registers collection 1538-1912, in co-operation with FindMyPastUK. 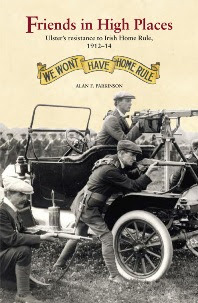 This evening – the eve of the centenary of the signing of the Ulster Covenant – sees the launch of a new book: Friends in High Places, Ulster's Resistence to Irish Home Rule 1912-1914 by Alan F Parkinson. A launch event, hosted by the Ulster Historical Foundation, will be held at the Christ Church Library, Royal Belfast Academical Institution, College Square East, Belfast BT1 6DL at 7pm. Guest speakers are Mike Nesbitt MLA and Lord Bew of Donegore. Light refreshments will be provided. Call 028 9066 1988 if you'd like to attend. The book itself, in paperback, can be ordered from BooksIreland for £12.99 +pp. FamilySearch has added 4.35million parish records from Wales to its database. The collection spans 1538 – 1912. Basic details are provided. For example, the marriage record for William Hughes reveals he wed Gwen Humprheys on 19 May 1834 in Maentwrog, Merionethshire. If, from there, you want to find the full details and see an image, you are directed to FindMyPastUK, where the full record is held. 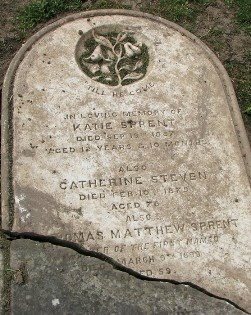 Similarly, FamilySearch's record will show that two-year-old Catherine Murphy died on 7 February 1862 in Bangor, Caernarvonshire; go to the full record at FindMyPastUK and an image of the burial register provides additional information. Update: Montgomeryshire was not included in the original upload of these Welsh genealogy records. The records from this county were added to the site on 6 October. Find My Past UK has added a collection of baptism and burial records from 1538-1890 for the 'county' of Middlesex to its database. Some 175,000 records are included (95,545 baptisms and 79,541 burials), and it's worth checking them out if your Irish ancestors may have been in the London area. The County of Middlesex has a troubled history! Ringing London to the east, north and west, it has been continually encroached upon by the capital city so that what now might be called Inner London was historically in Middlesex. Think Bethnal Green, the heart of London's East End and about as Cockney as you can get; it was once an area of disease ridden slums and poverty, and a lot of Irish lived there alongside other immigrant workers and paupers (certainly rather more than lived in the toffs' houses in other parts of Inner London/Middlesex, that's for sure). The historic county has since been engulfed by Greater London or absorbed into the neighbouring counties of Hertfordshire and Surrey. You can download a pdf of the areas covered by the baptism records here, and of the areas covered by the burial records here. Last weekend's announcement that the National Library of Ireland plans to digitise its collection of Roman Catholic parish registers (see my report) is now official! The Library's tender notice has gone live on both the EU and Ireland's public procurement sites. The digitisation of the NLI's collection of material of genealogical interest, including parish records, directories and register of electors. The digitisation of the NLI's photographic collection. Precise details will only be provided to those applicants who pass through the first round of shortlisting. Applicants can apply for one or more of these lots and must have provided digitisation services to at least one cultural institution similar to the NLI in the last five years. The deadline for applications is 1 November 2012. You can view the full tender notice here. Just as I was wondering what had happened to the Irish Family History Society (IFHS) – the silence over the last few months has been noticeable – it's stuck its head back over the parapet. And I'm sure I'm not the only one that's pleased to see it. After five years of planning and building, the McClelland Irish Library in Phoenix, Arizona is to open to the public and to genealogy researchers. The library holds more than 6,000 books, journals and periodicals on Irish genealogy, literature and culture and aims to be recognised as a major Irish genealogical research centre. There is also an ongoing exhibit of The Book of Kells and a number of reading rooms and computer resources. It was founded by Norman McClelland, chairman of Shamrock Foods, who had traced his own roots in Ireland and Scotland. Four of his books now form part of the library collection. The 15,000 sq ft building, at 1106 N. Central Avenue, Phoenix, resembles a traditional Irish castle, and elements of it were constructed using Irish Blue limestone by an Irish stonemason. A grand opening gala will take place this Saturday (tickets) and the library will officially open its doors to the public on Tuesday 2 October. Free tea, soda bread, Irish entertainment and library tours will greet visitors on the first day. Opening hours 10am-3pm Tuesday to Thursday in October; 10am-3pm Tuesday to Sunday in November. For more information visit www.azirishlibrary.org. A new six-part TV series starts on RTÉ One on Tuesday 2 October to promote Ireland's big 2013 happening called The Gathering. In each episode of The Gathering - Homeward Bound, a well-known Irish person who lives abroad will return to their home or other significant place to dig in deep with the local communities as they prepare for the return of the Diaspora. Among the celebrities featured in the line-up are rugby star Trevor Brennan; musician Bressie; dancer Jean Butler; comedian Brendan Grace; Kerry GAA and Aussie Rules footballer Tadhg Kennelly; and actress Fionnula Flanagan. As well as portraying each individual's response to their return journey, the series will examine the area's own story of emigration, meeting local historians, visiting libraries and viewing church records. Finally, each of the six will create a video invitation to the world, asking them to return to the person's chosen town in 2013. The opening episode sees comedian Brendan Grace return from Florida to celebrate The Liberties in Dublin city and hear what plans are afoot to attract people abroad to come home for The Gathering 2013. Tuesday 9 October: London-based Bressie returns to Mullingar. Tuesday 16 October: Trevor Brennan travels from France to his native Leixlip. Tuesday 23 October: Tadhg Kennelly returns to Listowel from Oz. Tuesday 30 October: New York-born Jean Butler reconnects with Westport. Tuesday 6 November: Fionnula Flanagan heads West from California to Connemara. The programme will be broadcast at 7.00pm on Tuesdays. Unusually, it will be available for viewers around the world on www.rte.ie/player. Two more collections from Kent have been added to the Family Search UK & Ireland collection. They are the Kent Register of Electors 1570-1907, which is grouped by Divisions and contains 131,968 images, and Kent Workhouse Records 1777-1911, which consists of 79,444 images of admissions and discharges browsable by Poor Law Union. While these records may be of interest to a significant number of people whose ancestors left Ireland, I mention them more to highlight a growing trend of additions to the FamilySearch database. These two collections have been digitised by Family Search on behalf of the local council (in similar cases, it might be the records of a family history society or some other specialised archive). The terms of each contract is different but nearly always involve some restriction on public access. Under the terms of the Kent arrangement, online access is restricted to visitors at the Kent History & Library Centre in Maidstone, Family History Centers and the Family History Library in Utah. The other type of arrangement increasingly being seen is the provision of a searchable index on FamilySearch to records held by a commercial organisation such as FindMyPast. While basic details from the record are returned from a free-to-all search on FamilySearch, the full record (and an image, if available) is only found on the commercial provider's database ie for a fee. The Irish Prison Registers collection is an example of this sort of deal. Of course, it's not just commercial providers who can take advantage of these arrangements. Cash-strapped councils and family history societies may see them as a way to generate a bit of money, too. Tuesday 25 September: Irish America and the Struggle for Freedom in Ireland, with Gerry Adams, president of Sinn Féin, at Burt Kahn Court on Quinnipiac University’s Mount Carmel Campus. Free public event. 8pm. For more details, tel 00 1 203-582-8652. Thursday 27 September: The Story Arc Of The Covenant: from signature to screen, with presenter William Crawley and producer Brian Henry Martin. Part of the Change, Conflict and Transformation, 1912-1922 Lecture Series. Venue: PRONI, Belfast Titanic Quarter. Free, but booking essential. 6.30pm. This lecture will focus on the making of Ulster Covenant, a one-hour documentary which is due to be broadcast on regional (NI) BBC1 at 9pm. Thursday 27 September: Friends in High Places - Ulster's resistance to Irish Home Rule 1912-14, book launch. Guest Speakers will be Mike Nesbitt MLA and Lord Bew of Donegore. Light refreshments and parking provided. Christ Church Library, Royal Belfast Academical Institution, College Square East. Belfast, BT1 6DL. 7:30pm. Friday 28 September: Celebrating Cork Past Exhibition, a day-long family heritage event focussed on Cork City and County's rich tradition and culture. Millennium Hall, City Hall, Cork. Local genealogy and history societies will be exhibiting. 10am-7m. Details. Friday 28 to Saturday 29 September: Voicing the past: oral history and heritage in Ireland. The Oral History Network of Ireland presents its annual conference. Temple Gate Hotel, Ennis, Co Clare. Programme. Saturday 29 September: The Top 10s of Genealogy, with Bridget Bray. Free session at New York Irish Center. Space limited, so email to book your place. From 2pm. 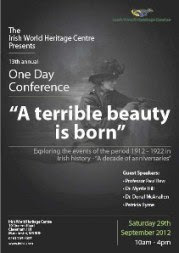 Saturday 29 September: A Terrible Beauty Is Born 1912-1922, a one-day conference at Irish World Heritage Centre, Manchester. 10am-4pm. £15/£12 includes lunch and refreshments. Details. Sunday 30 September: Explore Your Genealogy, with Carolyn Williams, NZ Society of Genealogists, Family Research Centre, Panmure. 10am-12noon. Part of the Auckland Heritage Festival. Free, but booking required. Tuesday 2 October: Caring for the history of the profession: Royal College of Physicians of Ireland archive collections, with Harriet Wheelock. Hosted by the Irish Society of Archives. Venue: Dublin City Library & Archive, Pearse Stree. Public lecture at 6.30pm. Free. Wine reception at 6pm. All welcome. Thursday 4 October: Celebrating Ireland's Archival Heritage Conference, Harbour Hotel, The Docks, Galway. Very interesting programme with well-respected speakers. Details. Friday 5 October: The Civic Guard Mutiny, with Dr Brian McCarthy. Garda Siochana Historical Society. Garda Club, Harrington Street, Dublin. 7.30pm. All welcome. Saturday 6 October: An introduction to Irish family history, with Dr Irene O'Brien. Mitchell Library, Granville Street, Glasgow G3 7DN. 10am-1pm. £15. To book: tel: 0141 287 2999. Saturday 6 October: Irish genealogy workshop, with Tom Toohey. Six ways to research your family history. Part of a series of three workshops, each independent of the others. Amesbury Public Library, 149 Main Street, Amesbury, MA 01913. 2pm. Space limited. Registration required. Tel: 978 388 8148. Saturday 6 October: Local History Day, at Dublin City Library & Archive, Pearse Street, Dublin. See programme. Free, but booking essential. The Public Record Office of Northern Ireland (PRONI) will once again host a series of lectures with the Open University Ireland (OU). The theme of this series will be Urban History. It will explore the development and organisation of local government and will provide plenty of social history background for those wanting to better understand their ancestors' lives. Thursday 25 October : 400 years of Urban Growth in the North of Ireland, with Janice Holmes. Wednesday 27 February: 400 Years of Urbanisation. Speaker's name to be advised. The National Library is to digitise its parish registers collection and other items of genealogical interest, according to a report in yesterday's Irish Times newspaper. The ultimate highlight of such a move would be public online access to the island's Roman Catholic baptism and marriage registers, most of which date from the late 18th century or early 1800s to 1880. It's probably best not to hold out too much hope for a free access model such as at irishgenealogy.ie, but you never know. Even if researchers do end up having to pay for online access, it's reasonable to assume they'll be working with a modern, digitised system, properly indexed and with images. Professional and amateur genealogists alike will consider it a huge step forward. Directories, electoral registers, journals and newspapers are also expected to be up for digitisation in the tender, which should be available for scrutiny later this week. The Library seems prepared to award collections individually or in smaller chunks to the right partners. 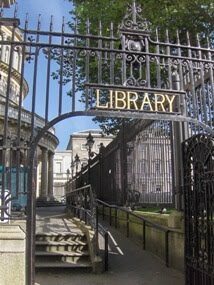 The Irish Times feature says the Library is looking for likely partners from both the commercial and the not-for-profit sector, whether Ireland-based or not. Fiona Ross, NLI's director, is quoted as saying that the core issue for the Library is that the further partner should have the necessary resources, funding and people to make it happen. You can read the Irish Times article here. And there's been a follow-up comment piece this morning. Aside of the main thrust of his article, with which I agree, the journalist says that Brightsolid are the opening favourite to secure the project. That may well be so, but Ancestry should not be overlooked; they are sniffing around with a view to expanding their Irish offer, now that they have a base in Dublin. The Public Record Office of Northern Ireland (PRONI) has contributed to an exhibition that explores historical developments in mental health care in Belfast. This exhibition – History of Mental Health Belfast: Colony to Community – will launch on World Mental Health Day, 10 October, and will culminate in a major event planned for next year. As it explores attitudes and impacts, and reveals interesting perspectives and practices, the interactive exhibition will follow the journey of mental health for both patients and staff, and feature the highs and lows in this history over the last century to today. Along with the photographs and artifacts on display, the launch day programme includes personal experiences portrayed through poetry, drama and music. Visitors are invited to attend the exhibition at Knockbracken Hall, Belfast from 10am to 1pm, and bring stories and memorabilia which will contribute to the final exhibition. Anyone with ancestors from the Magherafelt area of County Londonderry, which roughly sits between Lough Neagh and the Sperrin Mountains, will be keen to check out a new online collection of graveyard records commissioned by the local district council. Magherafelt District Council cares for some 60 graveyards across the district. These include parish churchyards, modern cemeteries and old burial grounds once connected to workhouses, penal institutions and decommissioned churches. It commissioned a Belfast company of graveyard surveyors to survey and create a detailed map for each of them, to take photos and record inscription, and then manage/upload the information collected to a free-to-access website. The results from the survey can now be found on www.discovereverafter.com. My quick search of the site reveals 24,415 entries. The earliest date of death I found in my recce was 14 February 1800. This related to a 27-year-old Robert Kelly who lies buried in plot 303, Magherafelt Milltown St. John's RC Churchyard. With him in the plot are three members of his family. The full inscription of the stone has been transcribed and a photograph of the stone can be viewed. In addition to details of the deceased in this churchyard, the site directed me to a brief history of the church, a printable location map, an interactive grave map, a link to historical documents relating to this church and a link to 'persons of interest' buried there. The most recent date of death I came across was 21 June 2012. It's obviously terrific to have this depth of information so professionally presented and freely available to genealogists worldwide, but I was curious as to the District Council's motivation. Head of Community Services Michael Browne told Irish Genealogy News that the online facility will be extremely useful to those researchers who contact the local Tourist Offices for details of their ancestors. 'The Tourist Offices receive enquiries on a daily basis from family historians around the world,' he said. 'They can now be directed to the website. With its simple and quick search, they will be able to see for themselves where their ancestors are buried, and receive good, factual information. So that's fine and dandy, but what about those parts of the site that suggest Birth and Marriage records might be in the plan? It seems these are wish-list items for now. But if they should ever materialise, they would be civil registration records rather than parish records. Rather less 'wish list' is the drop-down menu of locations searchable on the website. While only Magherafelt returns any entries, the intention is clearly there for the site to include the results of many more graveyard surveys. In fact, every district council in Northern Ireland is in the list. I contacted the graveyard surveyors, GSS (NI) Ltd, which trades as Everafter. Business Development Manager Teresa told me that everafter has contacted all Northern Ireland councils and, indeed, several in the Republic. While some councils are interested in graveyard surveys and the detailed maps that can be produced from them, the records that can be gathered will only be added to the discovereverafter website if a full management/upload commission is received from the council. This, then, is a website to watch, as more surveys are completed and similar batches of burial records are made available. The Council of Irish Genealogical Organisations has campaigned long and hard for improvements at the 'coal face' of Irish genealogy: Dublin's General Register Office. Finally, there appears to be a glimmer of hope that pleas for change are finally being listening to! In the past couple of weeks the GRO has quietly introduced a change in policy for 'General Searches'. Hitherto, when a party of people came in to the GRO's Dublin-based Public Search Room each of the party was required to pay a General Search fee of €20. Now, up to three persons can work on one General Search fee and can collectively take up to five years of indexes from the shelves at any one time. Further, each person on a General Search is now entitled to up to eight uncertified copies (photocopies) of register entries, rather than five, as had been the case until now. See the new search form below. Whether these changes were made on foot of the criticism levelled at the GRO by the Irish Ombudsman in her recent report (Hidden History? The Law, the Archives and the General Register Office) is not clear. 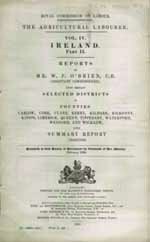 CIGO was one of the two main genealogy organisations which were asked to give evidence to the Ombudsman for inclusion in the report. However, it seems too much of a coincidence not to have played some part in this change. It is still too early to say if these changes will have any marked effect on how researchers manage their time at the GRO. While welcoming these changes Steven Smyrl, one of CIGO's two Executive Liaison Officers, said that "On a daily basis some researchers require more than eight photocopies while others require only one or two. A more efficient method of supplying photocopies of register entries would be to allow researchers to apply for up to three at a time and then, once they have been supplied, to be allowed to submit another three photocopy request slips and so on." In the meantime, genealogists should keep in mind that they can also apply for uncertified copies (photocopies) from the local Dublin registration office on Lombard Street East, about 8 minutes walk from the GRO. Provision of uncertified copies (photocopies) at Lombard Street East was secured four years ago through successful lobbying by CIGO. Admission is free. Booking essential. While morning tea and coffee are provided, lunch is not. Venue: Dublin City Library & Archive, 138-144 Pearse Street, Dublin 2. Email for more information or to book. 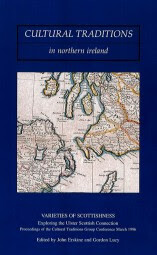 Books Ireland, the online book department of the Ulster Historical Federation has aquired a number of special offers of quality titles from the Queen's University Institute of Irish Studies. Displaying Faith: Orange, Green and Trade Union Banners in N.I. Find out more about these books and other special offers here. 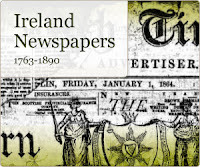 Ancestry has added a collection of Irish newspapers to its subscription site. They aren't indexed, so you can't search for ancestors by name or by events, but you can browse through selected batches by date. They span the years 1763 to 1890. The span of dates shown does not mean that every issue within that time frame is available. In addition, a copy of Thom's Directory 1904 can be browsed. 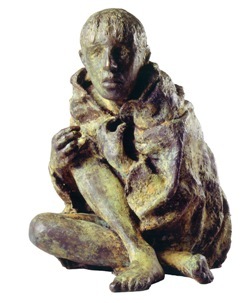 The Great Hunger Museum/Museam An Gorta Mór will open to the public at Quinnipiac University, Connecticut on 11 October. The museum's collection focuses on the famine years from 1845-52, when blight destroyed virtually all of Ireland’s potato crops for consecutive years, and includes works by noted contemporary Irish artists including internationally-known sculptors John Behan, Rowan Gillespie and Eamonn O’Doherty, and contemporary visual artists Robert Ballagh, Alanna O’Kelly Brian Maguire and Hughie O’Donoghue. Featured paintings also will include several important 19th and 20th‐century works by artists such as James Brenan, Daniel MacDonald, James Arthur O’Connor and Jack B. Yeats. Museum programs, including tours of the collection, discussions, films, plays and concerts, are designed to educate the general public, scholars, researchers, artists and students about the richness of Irish culture and the high quality of its visual arts. For more information, read the feature in today's Hartford Courant. Ireland XO (Ireland Reaching Out), the so-called 'reverse genealogy' initiative designed to encourage the Diaspora to visit the homeland of their ancestors, has launched a new newsletter called Ireland XO in Action. The first issue brings news of the progress being made by parishes as they reach out to the descendants of emigrants and invite them back. It's obvious that very real connections are being made. This isn't just a marketing exercise. It really is making a difference to people and knocking down family history brickwalls in the process. For example, the launch issue carries a short feature about Margaret McKeown of Western Australia. Her 30-year research suggested that her 2xgt grandparents were buried in the graveyard of the Carmelite Abbey of St. Mary’s in Loughrea, which is not open to the public. Having made contact with the local Ireland XO parish team, a special appointment was made for Margaret to visit the graveyard where she did, indeed, find the grave of her ancestors. And more of them than expected... she also discovered the grave of her 3xgt grandparents! In addition to success stories, Ireland XO in Action also carries interviews with some of the people involved in the scheme and articles about some of the parishes taking part. Family Search has added the UK Maritime Births, Marriages & Deaths 1787–1933 collection to its huge database. The details returned from a search are limited to the person's name and the date of the event, together with the name of ship. If you want to investigate further, you are referred to FindMyPast to view the full details and an image of the original record. Obviously, given the start date, this collection includes many bmds of Irish people, but it consists of only 42,183 entries in total so it isn't going to solve too many mysteries. However, it's always worth checking, even if the standard of recording wasn't exactly fulsome. Birth information is pretty scant (example: a child was born to the wife of Sergeant Driscoll on 4 November 1859 on the Ealing Grove), but there's a bit of an improvement with marriages (example: Miss I Doherty, a stewardess, married Paul Striebeck, a single, 32-year-old seaman, on board the ship Nilverton on 11 June 1899, the initials of the bride's father being H and the groom's father F). Deaths, don't typically provide much genealogical data (a significant proportion are of infants and young children, in any case) but you might find an occasional death worth following up if it seems to connect with a family tale (example: Daniel Driscoll, aged 40, drowned on 26 August 1878 while on the ship City of Brussels). The collection can be found here on Family Search or you can search at Find My Past. Eneclann has released another batch of books in digital format, making them much more affordable in the process. The list of the books is below. Further details of each publication can be found here. An earlier batch of newly digitised books was announced last month. See report. Christine Finn of Ireland Genealogy Project Archives reports that two sets of Headstone photos — from Monaghan Town and Wicklow Parish Church — have been donated this month. 'Some of the headstones in the Wicklow Parish set are mentioned in Brian Cantwell's Memorials of the Dead, she says. 'If you love old headstones, check these out. 'In addition, we are continuing to add Royal Irish Constabulary record extractions and Memorial Cards. Saturday 15th: The early medieval kingdoms of Donegal, some new thoughts, with Dr Brian Lacey delivering the 2012 Paddy McGill Memorial Lecture. 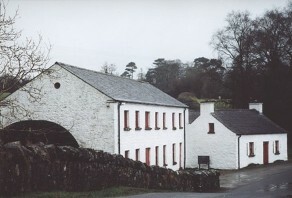 Donegal Historical Society, Heritage Centre, Ardara, Co Donegal. 8.30pm. Saturday 15th: Remembering the Ulster Covenant, a HistoryIreland Hedge School at the Regional Cultural Centre, Letterkenny, Co Donegal, with Brian Kennaway (Irish Assoc), Éamon Phoenix (Stranmillis), Margaret O'Callaghan (QUB) and Pádraig Óg Ó Ruairc (Univ of Limerick) 2.30pm. Free. Followed by an exhibition opening at Donegal County Museum. Monday 17th: Planned land settlement in 19th and 20th century Ireland, with Suzanne Begley and Miriam Moffitt. Clanricarde's planters and land agitation in East Galway 1886-1916; and The Land Commission and the making of Ráth Cairn, Co Meath 1935. Royal Society of Antiquaries of Ireland, 63 Merrion Square South, Dublin 2. Tuesday 18th: Dublin 100 years ago, an illustrated talk with James Scannell. In addition, there will be a short talk on the history of the local nursery trade, with Myles Reid. Foxrock Local History group. Venue: Foxrock Pastoral Centre, Dublin 18. 8pm. All welcome. Admission € 4.00. Tuesday 18th: The Crusader’s Tale, with Edward Coleman. Tales of Medieval Dublin series. William Fitzroger was a Prior of the Order of the Knights Hospitaller in Ireland based in Kilmainham in the late 13th century. His conflicting loyalties to his king and his order presented him with a difficult choice: would he fight for the Holy Land or defend the English colony in Ireland? Wood Quay Venue, Civic Offices, Dublin 8. 1.15pm to 1.45pm. Free. More information. Tuesday 18th: The Clothworkers, with Alison McCaughran. Coleraine Historical Society. Guide Hall, Terrace Row (Mountsandel Road). 8pm. Non-members £2, includes tea and biscuits. Wednesday 19th: History and traditions of the Grand Orange Lodge of Ireland, with David Scott. Carrick-on-Shannon & District Historical Society are the hosts and the talk will take place at the Bush Hotel at 8.30pm. All welcome. Thursday 20th: The Ulster Covenant and Ulster Unionist resistance to Home Rule, 1912-1914, with Dr Tim Bowman. Part of the Change, Conflict and Transformation, 1912-1922 Lecture Series. PRONI, Belfast Titanic Quarter. Free. 6.30pm. Thursday 20th: Gold Frenzy – the story of Wicklow's gold rush, with Peader McArdle. Bray Cualann Historical Society. Bray Chamber of Commerce House, Quinsboro Road. Thursday 20th: Symposium on the Ulster Covenant, with Gordon Lucy, Dr Trevor Morrow, Dr William Roulston and Dr John Dunlop. Malone Presbyterian Church, Belfast, 7:30pm. Friday 21st The Kildare Place Society and Schooling in the 19th Century, exhibition opens at the National Museum of Ireland, Collins Barracks. All exhibits are from the CICE Plunket Museum and the CICE archives. Exhibition will run until June 2013. Tel: 01 6777444. Friday 21st: Visit the National Library on Culture Night. View the magnificent Reading Room, explore the excellent exhibitions, meet the staff and find out more about the Library's many treasures. There's also live music and readings and refreshments at Café Joly. From 5pm to 11pm. No booking required. Kildare Stree, Dublin. Friday 21st: Also at the National Library of Ireland, the Genealogy Advisory Service will be holding a Culture Night special from 5pm to 10pm. No booking is required; the team will be giving advice on a first come, first served basis, and it's free. Friday 21st: Who do you think you are?, a genealogy session as part of Culture Night at the National Museum of Ireland, Castlebar, Co Mayo (Activity & Resource Rooms, Level C). 6pm: Introduction by Stella Cafferty of Mayo Genealogy Group. Find out how about the Mayo Genealogy Group and hear their plans and aims for the future. 6.15pm: Researching your ancestors at home (Ireland), with Dympna Joyce. 6.30pm: Researching for your ancestors abroad, with Dympna Joyce. 6.45pm: Chat to members of the Mayo Genealogy Group for some practical advice, hand-outs and hands-on help on how to research your family history. Free. No booking required. Friday 21st: Family History on Culture Night at Dublin City Library & Archive. Advice and suggestions will be offered throughout the evening. Beginners welcome. Among the organisations taking part are the GOONS, GSI, Ancestors Network adn the Irish-Jewish Society. Venue: 138-144 Pearse Street, Dublin 2. From 5pm to 10pm. No booking required. Friday 21st: Tours and talks at Glasnevin Museum on Culture Night. Tours of the O'Connell crypt at 5.30pm and 6pm. The architect who designed the museum, Hugh Maguire, will give a talk entitled 'The Architecture of Glasnevin Museum' at 7pm. Free but booking required as places are limited. The Museum itself will be open, free, from 5pm to 9pm. Saturday 22nd: The Ulster Covenant and contemporary Ireland, with John Coakley, Ed Curran, Paula Devine, Brian Feeney, Michael McDowell, Margaret O'Callaghan, David Trimble and Graham Walker. Hosted by the Institute for British-Irish Studies and the Irish Association for Cultural, Economic and Social Relations at the Linen Hall Library. Belfast. Admission £10/€12. Saturday 22nd: PRONI will be exhibiting at the Spectrum Centre, 331 Shankill Road, Belfast, as part of the Militaria Collectors Fair & Ulster Covenant Exhibition. 10am–5pm. Free. Details. Back To Our Past – click to download 50% discount voucher. The lecture programme has now been finalised for the Back To Our Past show next month. It looks terrific, with a wide range of options for all family historians, no matter what stage they're at, and even a Hedge School thrown into the mix, when Tommy Graham, editor of HistoryIreland magazine, will chair a round-table discussion entitled 'Genealogy - who does it think it is?'. Tickets for the presentations cannot be booked in advance. Seats are available on a strictly first come, first served basis, and all the talks are free. See the full programme here. Ancestry UK has added a new collection – Masters and Mates Certificates, 1850-1927 – to its database. This is a collection of certificates issued to merchant seamen by the British Board of Trade, and there are plenty of Irish (including seven entries for my Wicklow and Cork ancestors) among the register of 250,000 individuals. UPDATE: There's a video below, giving some further background to the collection. Very interesting conference taking place early next month in Galway. It's billed as the 2nd Galway City International Heritage Conference and its theme is: Celebrating Ireland’s Archival Heritage. It will take place on Thursday 4 October at the Harbour Hotel, The Docks, Galway. 9:15: Welcome by Mayor of Galway City, Councillor Terry O’Flaherty. 9:25: Official Opening by Dr. Jim Higgins, Heritage Officer. Chair: Aideen Ireland, Senior Archivist, National Archives of Ireland (NAI). 10:00: Building a Research Archive, The James Hardiman Library Archives, NUI Galway, with Kieran Hoare, Special Collections NUI Galway. 11:30: Why Irish Archives Matter, with Dr. Raymond Gillespie, NUI Maynooth. 12:15: The Archives and the decade of commemorations: The Iconic versus the enduring, with Eunan O’Halpin, Trinity College Dublin. 13:30: Protecting Your Archives, Caring for your Collection, with Benjamin van DeWetering, Ox Bindery, Co. Sligo. Chair: Dr. Raymond Refaussé, Church of Ireland RCB Library, Dublin. 14:15: Collecting the Nation: Archival Material in the National Museum of Ireland’s Collection, with Lar Joye, Assistant Keeper at the National Museum of Ireland, Collins Barracks, Dublin. 15:00: The Digital Challenge – Archives of the Future – The Future of the Archives, with Christian Schneeberger, Swiss Theatre Archives, Berne, Switzerland. 15:45: Collecting the Nation: Archival Material in the National Museum of Ireland’s Collection Comdt. Padraic Kennedy, Officer in Charge, Irish Defence Forces, Military Archives. Cost: A nominal fee (€10, Concessions €5)will be payable on the day of the Conference only. BOOKING IS ESSENTIAL. Email or phone- (00 353) (0)91 536 410 for more information. 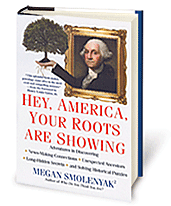 Interesting event in New York this Wednesday evening, when well-known US genealogist Megan Smolenyak will be giving a talk named after her new book: Hey America, your roots are showing. While there's a little of specific Irish relevance, there will be plenty of general genealogical interest as well as revelations about how she solved baffling history mysteries. How, for example, could brothers also be uncle and nephew? How did Facebook help solve an Egyptian genealogy case in just one week? How did a pair of tombstones in Ohio point the way to Barak Obama's Irish roots? Megan will explain. A book signing will follow the talk, which will be held at New York Public Library, Stephen A Schwarzman Building, South Court Auditorium (5th Avenue at 42nd St) on a first come, first served basis from 5.30pm to 7pm. FindMyPast Ireland's 10% discount offer will end this Friday, 14 September, so act now to take advantage of it. The offer was introduced as part of FMP.ie's relaunch in mid-August and can be exercised across the database portfolio. There is also a Pay-As-You-Go (90-day) option of 100 credits for €9.95 (same cost regardless of which collection you're using). Minnesota Genealogical Library will be holding an Irish Saturday tomorrow, 8 September, hosted by the Irish Genealogical Society International (IGSI). The library, which holds such an event most months, is staffed by experienced researchers from the IGSI who work with less-experienced family historians to acquiant them with the library and its collection, teach them the tools of basic Irish research, and help them to use Griffiths Valuation, Irish Origins, maps and other resources. Tomorrow's event will see a special class that's designed for those who want to find out more about their ancestor's immigration ie how to search for immigration papers, where and when to look and what you might find on passenger lists. The instructor will be Linda Miller. Cost: Class – $10 IGSI members, $15 non-members. Library – free to IGSI members, $10 non-members. Venue: Minnesota Genealogical Society Library, 1185 Concord St N, South St Paul, MN. Time: Class 10.30am to noon. Library open 10am to 4pm. Doors will be thrown open this weekend across Northern Ireland with the arrival of Heritage Open Days Weekend. This popular celebration of built heritage gives the public a chance to see inside many buildings from cottages to castles and private homes to Parliament Buildings that aren’t usually open to the public. Two burial grounds that are normally open only by appointment will be open for visitors as part of the local programme. Clifton Street graveyard was first opened in 1797, and contains the graves of many notable families, including the Dunvilles, the Sinclairs and the McCrackens. It's at Henry Place, Belfast BT13 1AD. Open 10am-4.30 Saturday and Sunday. Friar`s Bush Graveyard is Belfast`s `official` famine site. It is thought to be the city`s oldest Christian burial ground, and contains the mass grave of hundreds of victims of Belfast`s cholera epidemics. Entry into the graveyard is through an arched gothic gate lodge, built by the Marquis of Donegall in 1828 on Stranmillis Road, Belfast. Open 1-5pm Saturday and Sunday. Armagh Gaol: Building dates from 1780. Closed in 1988. This may be one of the last chances to see inside before it gets turned into a luxury hotel and spa. The Mall, Corporation, Armagh. Open 12noon-5pm Saturday and Sunday. Moyallon Quaker Meeting House: One of the oldest Quaker Meeting Houses in Ireland. Has historical burial ground beside it. 117 Stramore Road, Moyallan, Gilford, Portadown, BT63 5JZ. Only open Saturday. PRONI: A day of tours, talks, exhibition and performance. Visitors will get a behind the scenes look at what PRONI does, and a flavour of the records held. At noon, visitors will also have the chance to meet Lord Carson, as actor, Paddy Scully, performs a one man performance in the building. Free. Bring photographic id. Titanic Quarter, Belfast. Full programme in Northern Ireland. It's that time of year again – the start of the academic year – and with it comes a long list of new courses in Irish genealogy research. Most of the courses below have an enrolment or application date in the next couple of weeks, so act quickly if you're intending to get started. Family History course over 10 weeks at Stranmillis University College, Belfast on Tuesdays, 7-9pm. Covers census, church and civil records as well as wills, estate papers and valuation documents. The course also includes a visit to the Public Record Office of Northern Ireland (PRONI). Fee: £55.00 (Concessions £45). Details or tel: 028 9038 4345. Genealogy course held over 10 weeks, with tutor Tony McCarthy. Western Gateway Building, Room 304, University College Cork. Tuesdays 2-9pm, starting 25 September. Focusses on genealogical sources, methodology and historical/social context. Fee: €230. Details or tel: 021 490 2301. NUI Diploma in Genealogy Studies at University College Cork. A distance learning diploma (NFQ, Level 7) specially tailored for adult learners wishing to obtain a third-level qualification in their locality. The course is offered on a part time basis over two years. It comprises fieldtrips to archives, interdisciplinary training, supervision of written essays and a thesis/dissertation on the topic of your choice, in a contextualised genealogical framework. University tutors and lecturers will attend UCC, Western Road, Cork City weekly. Fee: €1,360 per annum (Concessions €1,000 pa. Details or tel: 087-9215715. An Introduction to Genealogy (also module one of University College Dublin's Certificate of Genealogy course), with tutor Sean Murphy. 10-week afternoon course on Wednesdays, 2-4.30pm, from 26 September to 5 December, except 14 November; Venue: Stillorgan Park Hotel. OR 10-week evening course on Wednesdays 7-9.30pm at Bellfield Campus from 26 September to 28 November. Fee for either course €300. Details. Diploma in Family History, delivered in conjunction with The Association of Professional Genealogists in Ireland (APGI) at Independent College, 60-63 Dawson St, Dublin 2. Tutors Paul Gorry and Eileen Ó Dúill. Tuesdays 6:30-9:30pm.12 week course from 9 October 2012 to 15 January 2013 (no classes 18 Dec to 1 Jan inclusive). €895. Details. Tel: 01-6725058. Genealogy - Family History Research course, with tutor Tom Coughlan guiding students through the finding out stage and then advising on how to set out an attractive family tree.Venue: Newpark Adult Education Centre, Newtownpart Avenue, Blackrock. Tel 288 4376. 8-week course held on Tuesdays 7.30-9.45pm. Fee €130. Details from tutor. Genealogy - family research for beginners, with tutor Máire Mac Conghail APGI, at Dundrum Adult Training and Education (D.A.T.E. ), Dundrum town centre. 10-week course. Wednesdays 9.30-11am. Starts 26 September. Fee €105 (Concessions €50). Details. Genealogy for beginners, with tutor Máire Mac Conghail APGI, at Kilternan Adult Education Centre, Ballybetagh Road, Kilternan, Dublin 18. A hands-on practical course on how to research family history. 10 week course. Wednesdays 12-2pm. Starts 19 September €143. Also, Genealogy continuation course for those who have completed a beginner's course. Thursdays 12-2pm. 10 weeks. Starts 20 September. Details. How to research your family history, with tutor Claire Bradley. This course shows students how to start their research, where to go and how to record what they find. Topics covered include the census, bmds, church records, wills and newspapers. It's aimed at the beginner researcher, but some computer skills are desirable. Mondays, from 24 September. Fee: €110. Malahide Community School. Enrolment evening 18 September, but online enrolment also possible. Enquiries: adulted@malahidecs or tel: 846 0949. Certificate in the History of Family and Genealogical Methods. One-year ECTS-accredited certificate course at University of Limerick on Thursday evenings 6.30-9.30pm (or online at a slightly higher cost of €784). The course is designed to cater for all people with a serious interest in history of family and genealogy methods. Assessment is portfolio based and concentration can be placed on developing your own family tree and contextualisation of place of origin. Details. Deadline for applications is Tuesday 11 September. Email. Genealogy course over 8 weeks at Bush Post Primary, Riverstown, Dundalk. Mondays 7.30-9.30pm. Course will concentrate on tracing your family roots throughout Ireland, north and south Optional Guided Tours of Local and public libraries will be available in order to facilitate students which will enable them to carry out their own research. Starts 1 October. Fee €99. Details or tel: 042-9376246. Trace your Irish ancestors, with Newcastle City Learning. 10-week Beginners course at Tyneside Irish Center, 43 Gallowgate, Newcastle Upon Tyne NE1 4SG. Thursdays 3.30-5.30pm. Fee: £58 (Over 60s £43.50, Concessions £5). Enquiries: Tel: 0800 073 0911 or 0191 298 6960. Genealogy-Researching your Family History, at Templemore College of Further Education. Some of this 10-week course will not be classroom based. Maximum number for class is 10 students. Mondays 7-9.30pm. Starts 24 September. Fee: €200. Details or tel: 504 31007. 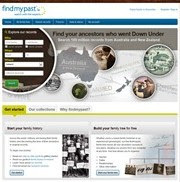 Presumably reacting to the recent launch of FindMyPast.com, with its extensive collection of records from this side of the Atlantic, Ancestry.co.uk has released a vast amount of new material. Nearly all of it relates to either England or Scotland, but there are a few collections that include a nod towards Ireland. Taking a random selection, it seems most of these new uploads are browseable books, rather than indexed records ready for searching. But valuable additions to online options, nonetheless. After Pretoria: The Guerilla War plus supplement to "With the Flag to Pretoria"
* The last twelve items have been added following an afternoon update to Ancestry's original list.